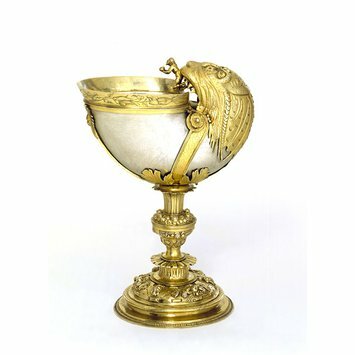 This beautiful cup was originally made from a nautilus shell, but at some point the shell must have been damaged. It was replaced in the mid-17th century by a silver facsimile. Shells from the sea mollusc Nautilus pompilius that lived in the Pacific and Indian oceans were valued for their rarity and beauty. Either in their natural state, or worked into elaborate objects, they were often found in the 'cabinets of curiosities' that contained the small treasures of a princely collection. Nautilus cups were particularly popular in Germany and The Netherlands, but they gradually became fashionable in England. 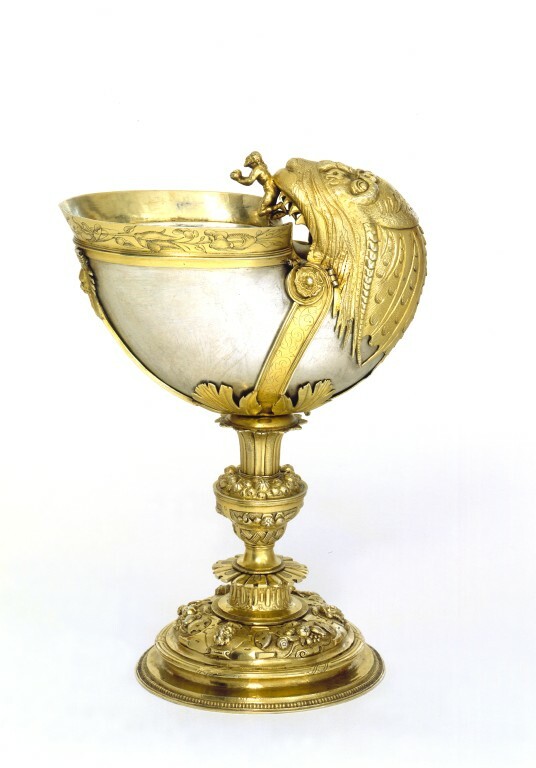 This cup has London hallmarks, but the crisp quality of the decoration and in particular the basket ornament on the stem are characteristic of Antwerp, Belgium. 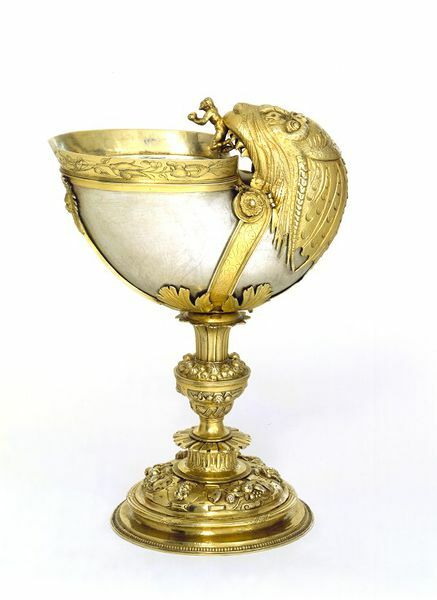 It is possible that the cup was made by an 'alien' or foreign goldsmith based in London. Equally, the style may have spread through engraved prints and the cup been made by a court goldsmith such as Affabel Partridge (active 1550, died 1568). The decoration of nautilus cups often refers to the marine origins of the shell. In this case, the end of the bowl is shaped like the gaping jaws of a sea monster. The small figure of Jonah kneels over the lip. According to the Bible, Jonah, attempting to escape from God, was swallowed by a great fish and lived in its belly for three days and nights before repenting and gaining his release. Cooper, John K. D. An assessment of Tudor Plate Design, 1530-1560. The Burlington Magazine, vol. 121, no. 915, June 1979. pp. 360-64.